True enough there’s something in the brushed aluminum and matt black finish and the proportions of the Soundbar that make people seem to want to get there hands on it – even before they know what it’s for. There’s more than just good looks going for the MP250 though. When connected to a laptop via its USB cord, the product from Edifier Enterprises Canada Inc. is able to pump up the volume those tiny, squeaky onboard speakers on your computer. I think it’s an ideal presentation companion for mobile workers. Don’t expect anything spectacular. 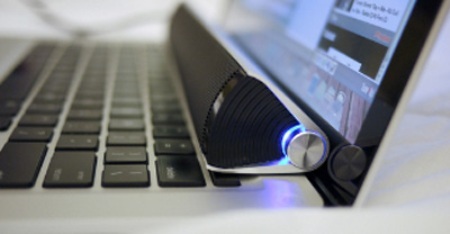 But audio will definitely be an improvement from what you hear from many of the speakers found in most laptops. The two-channel speaker comes with two 1.25-in drivers with a power output of 2 watts each. The Soundbar’s dimensions are 282x145x59mm and it weighs around 0.5kgs or 1.1lbs. The gadget has a volume control on the side but you can also use the host device’s volume controls. The device can sit on your laptop or netbook just where the keyboard and the screen meet or you can place it on your desk beside your computer. It also comes with its own drawstring carry pouch. The MP250 retails for around $39.99 at online stores like NCIX.com. I like the streamline looks of the Soundbar. Even if it’s another device you have to connect to your laptop, the overall look doesn’t appear cluttered because you are able to tuck away the speaker into that space between the keyboard and screen. But, if you’re one of the people who can’t find enjoyment with your laptop’s built-in speakers but find earphones clumsy, this product might just be for you. The Soundbar is wonderful for watching movies on the road when you don’t need to worry about bothering other people such as when you’re on a plane. It’s especially useful when you need to share video content on your laptop with some clients or do a quick video presentation on the fly.